This time next month we’ll have watched Pro12 rugby on Sky for the first time. 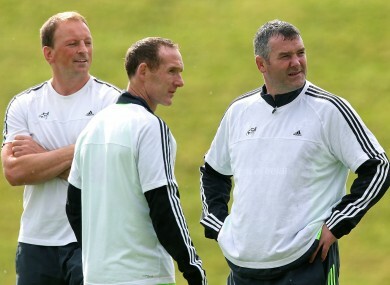 Technical Advisor Mick O'Driscoll, Assistant coach Ian Costello and head coach Anthony Foley oversee training at UL last week. DATES AND KICK-OFF times for the new Guinness Pro12 campaign were confirmed today with Anthony Foley’s Munster getting the season under way at home to Edinburgh at 19.35 on Friday September 5. That fixture will br broadcast live on TG4 with Sky Sports’ Pro12 coverage beginning with Llanelli v Ulster at 14.40 the following day. Leinster’s trip to Glasgow will follow that fixture on the same channel at 17.15, clashing with Connacht’s home tie against the Dragons – which will not be televised. TG4 will also host the season’s first inter-provincial clash when Leinster travel to the Sportsground on September 19, while Sky have will broadcast the eastern provinces’s meeting with Munster at the Aviva Stadium on October 4. Here’s the full list of confirmed kick-off times and broadcasters for the new Pro12 season. Email “Axel's Munster will kick off the new Pro12 season, Sky cameras trained on Ulster and Leinster”. Feedback on “Axel's Munster will kick off the new Pro12 season, Sky cameras trained on Ulster and Leinster”.